Music to My Ears was designed for Cancercare Manitoba in 2004. The concept was one of travelling minstrels: skilled musicians who would play for patients, families and staff in chemotherapy treatment, radiation and clinic waiting areas, creating calm, soothing distraction from the stress and anxiety associated with illness and treatment. Great-West Life provided two years of seed funding, after which the Cancercare Manitoba Foundation assumed musician costs with Artists in Healthcare providing administration, recruitment, training and supervision. Currently Music to My Ears also provides services at St. Boniface and the Grace General Hospitals year round. Guitarists and harpists play in Intensive Care, Oncology, Dialysis, Geriatric Rehab, Pediatric Ambulatory Clinic, Palliative Care, Hospice, Psych Health, Woman and Child and generally throughout the hospitals. 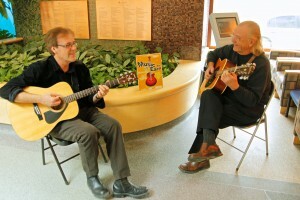 In fall 2009 Music to My Ears expanded to the Boundary Trails Health Centre and the Brandon Regional Health Centre with musicians playing in the Community Cancer Program and on adjacent hospital units. The program will be opening at Bethesda Hospital in Steinbach 2010. This series is collaboration between Artists in Healthcare and the Winnipeg Symphony Orchestra. For the past three years, sponsored by Great-West Life, it has provided 14 string quartet performances and five concert harp performances to long term care residents at Deer Lodge, Middlechurch Home of Winnipeg, Misericorida Place and Misericordia Health Care Centre, Riverview Health Centre, St. Amant Centre, Victoria General Hospital, Golden Links Lodge, and to the Buhler Gallery and the Geriatric Day Hospital at St. Boniface Hospital. One aspect of the position requires students to document/journal their experiences on a weekly basis. Click here to read some 2010 excerpts and some 2011 excerpts of student experiences in the Artists in Healthcare program. Thanks to support from Long & McQuade music, Music to My Ears musicians are recording a CD which will be given to patients, families and staff and made available for purchase on this website in 2012.